One theme explored in the book is the usefulness of feedback to the driver, as well as the occasional unwillingness for a driver to want to hear this “feedback” (what we colloquially call ‘back-seat driving’). Some curious process occurs between man and machine by which they suddenly feel themselves above criticism, incapable of making an error, that they alone understand the road and traffic conditions. For anyone to suggest otherwise risks earning their wrath, despite the fact that studies have shown non-teen drivers with passengers are involved in fewer crashes than those flying solo. A forthcoming study out of Kenya again hints at this dynamic. 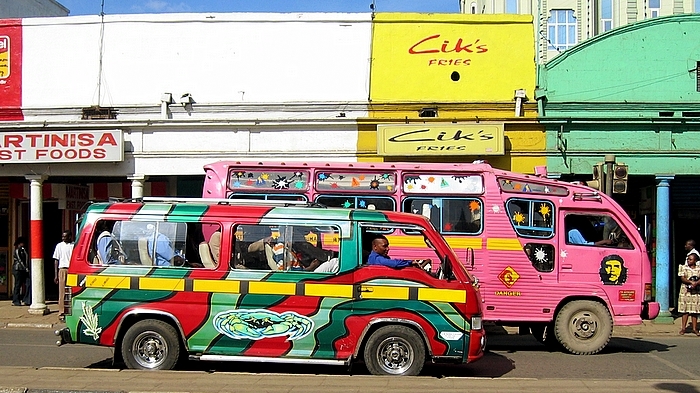 A pair of researchers at Georgetown University equipped a number of matatu buses, the private fleet of microbuses typical in many developing nations, with posters urging passengers to “heckle and chide” the driver if he is driving too recklessly. Rather like the recent hotline numbers at football games in which patrons can report drunken and abusive fans around them, the posters work on the idea that while everyone may be gripping the seat as the driver slaloms around town, no one individually feels empowered to speak up (a campaign in Ireland called “He Drives, She Dies,” urged a similar thing for female passengers in their boyfriend’s cars — it turns most who are killed or injured do so while passenger to a male driver; research apparently showed that most didn’t want to urge the driver to slow as they feared they would actually increase their speed if they did so). The research — I’ll be posting again on the paper — apparently shows that buses in which the posters were displayed were involved in fewer crashes than those in which no posters were displayed (the buses account for some 20% of crashes in Kenya). Comments Off on If You See Something, Say Something. Click here to leave a comment.